Roll Around is another advertising-supported application. It has an official website; however, many computer users feel that it has simply entered their systems without their consent. It does not really matter how Roll Around has managed to enter your system because we suggest that you remove it. It is better to do that as quickly as possible because you will soon notice that its ads are very annoying. Actually, all these ads might take you to corrupted websites as well, which means that you risk infecting your system with malware. We do not think that you prefer to encounter malware, so we suggest that you remove Roll Around as soon as possible. Of course, you might wonder why you should remove Roll Around because it looks rather decent at first sight. Keep in mind that it is very important to remove it because it will bombard your screen with ads that might expose you to potential threats. Research has shown that advertisements might be directly associated with corrupted websites because unreliable links that will take you to the websites full of malicious software might be embedded into them. In addition, our specialists say that it is very likely that adware will record such details as IP address, your approximate location, Internet service provider, and even search queries and the websites which you visit the most frequently. If you do not want to reveal any of these details, you have to remove Roll Around as quickly as possible. You will not find the download button on its official website rollaround.net, which means that it is impossible to download it from there. Of course, the program is still very prevalent because it tends to travel bundled with various programs, especially those that belong to the category of freeware or shareware. In most cases, computer users download Roll Around from various unreliable third-party websites. They might enter your system without direct permission as well. Either way, you have to remove Roll Around from the system. Continue reading to find out how to do that. 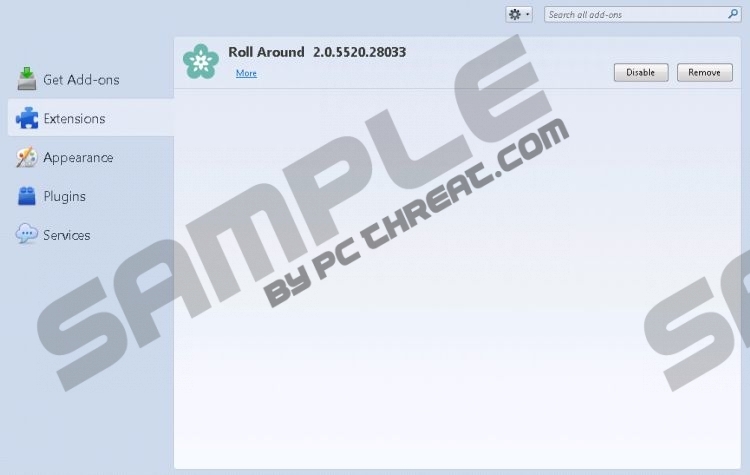 Roll Around is identical to Strong Signal, which is a very popular adware program. Thus, you will be able to remove Roll Around via Control Panel as well. Do not worry if you are not sure how to do that because we have prepared the manual removal instructions for you. Keep in mind that you can delete all the existing infections automatically as well. If you decide to remove Roll Around automatically, we recommend using SpyHunter for this matter. It will definitely erase different kinds of infections from your computer. In addition, it will protect your PC if you keep it enabled all the time. Right-click on the suspicious program and then click Uninstall. Quick & tested solution for Roll Around removal.